(Jay Syrmopoulos) Former President Jimmy Carter pulled no punches in a recent interview with The New York Times, clearly stating that he does not believe the widespread propaganda campaign accusing Russia of stealing the 2016 presidential election from Democratic candidate Hillary Clinton. “I don’t think there’s any evidence that what the Russians did changed enough votes, or any votes,” Carter told The New York Times in an interview published on Saturday. The damning comments from the former president, who said he voted for Bernie Sanders in the Democratic primary, comes as the flailing anti-Russia propaganda campaign, while ongoing, has seemingly stalled out. As has been widely reported, a Clinton staffer wrote a book called Shattered that revealed the “Russia did it” narrative was concocted by Clinton campaign chairman John Podesta and campaign manager Robby Mook within the first 24 hours of Clinton’s loss in the 2016 presidential election in an effort to deflect attention away from the dismal campaign of Clinton. The narrative forwarded by the Clinton loyalists had the intent of creating a paradigm that would handicap the incoming Trump administration from achieving their foreign policy goal of creating a new, less adversarial, relationship with the Russia and the Putin administration. Although a congressional investigation and special prosecutor continue to investigate the claims of Russia collusion with the Trump campaign, there has been no evidence presented that intimates any type of improper relationship between Trump and Russia. In fact, the Russophobes have become so desperate that they recently attempted to claim that “Russia linked accounts,” which is extremely nebulous terminology, purchased $100,000 in Facebook ads in an effort to propel Trump to the presidency. The problem with this line of thinking is that the ludicrous idea that Russia influenced the election with $100,000 in ads, when over a billion dollars was spent between the candidates in an effort to influence voters, is utter lunacy. • State Dept. Approves Russian Purchase of 20% of U.S. Uranium Assets in Return for $145 million in Contributions to the Clinton Foundation – Bill and Hillary Clinton assisted Canadian financier, Frank Giustra, and his company, Uranium One, in the acquisition of uranium mining concessions in Kazakhstan and the United States. Subsequently, the Russian government sought to purchase Uranium One but required approval from the Obama administration given the strategic importance of the uranium assets. In the run-up to the approval of the deal by the State Department, nine shareholders of Uranium One just happened to make $145mm in donations to the Clinton Foundation. Moreover, the New Yorker confirmed that Bill Clinton received $500,000 in speaking fees from a Russian investment bank, with ties to the Kremlin, around the same time. Needless to say, the State Department approved the deal giving Russia ownership of 20% of U.S. uranium assets. In addition to stating that Russia didn’t hack the election, the 93-year-old former president established a number of other painful realities for the establishment and their mainstream media propagandists. “I don’t think there’s any evidence that what the Russians did changed enough votes — or any votes,”Carter said. The former president opined, “we have 22 votes in our family and Obama got all 22 of them,”complaining that Obama had “refused” to engage in diplomacy with North Korea, and lamented the fact that Obama joined in the bombing of Yemen – which has resulted in massive humanitarian crisis. While Trump’s bombastic nature surely plays a part in the negative coverage, a recent Harvard study proved Carter’s comment to be quite accurate, as it revealed that 93% of news coverage about President Trump is negative. In spite of the constant attacks on Trump for Russia and other hyperbolic and largely irrelevant issues, the media remains entirely, and predictably, silent on Trump’s dealings with Saudi Arabian terrorists, slaughtering innocent children in Yemen, and perpetuating and maintaining the murderous mission of the military-industrial complex. 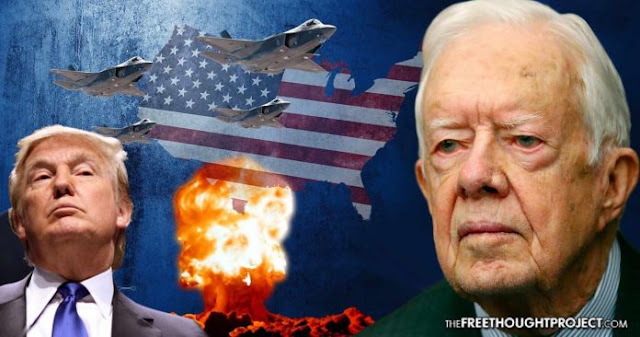 When Carter was asked about Trump souring the image of the U.S globally, he defended his successor and laid blame on American imperialism and its continual drive for hegemony.